A recent newspaper article discussed the ongoing “death of voicemail”, particularly in the case of millennials. Now, I have previously pontificated on some the difficulties of communicating with millennials, Millennials and Competitive Intelligence (2 parts), but this takes it to a new level. If the trend this fascinating article describes holds, the death of voice mail will have a significant impact on competitive intelligence research’s elicitation interviews. One key element of that is that you, the researcher, are able to get access to someone you have never met, whose business email and/or personal email accounts you do not know, to talk with them. As an aside, the people and patterns described in this article do not bode well for those very millennials described therein. Why? Ok, how do you get to know new people in your own business or neighborhood or graduating class when you only respond, by email or text, to a message on your voice mail (but never listening to the voice mail), only so long as you already know that person’s phone numbers and email addresses. A very static circle, isn’t it? I wonder what would happen if the EVP called one of these people to ask questions about a report he/she did, and never received a reply because the employee did not recognize the EVP’s cell number, so he/she just deleted the message without listening to it. Think about it. ETHAN BARON, “How the death of voicemail is changing the way we connect”, The [San Jose] Mercury News, May 13, 2018. When researching long-range trends, or more accurately spotting long range trends, you should seek out sources that (a) are thinking about the future and (b) have had some reasonable success in identifying such trends. Development of smart clothes and spam filters. Stagnation in middle income salaries due to the Internet producing more candidates competing for jobs. Marketers use of the Internet and your computer to track your interests and activities so that their marketing can be ultra-focused. People giving up privacy for more security to the point that there will be cameras virtually everywhere. The corollary that “everyone will be a news reporter”. Of course, this sage was also wrong, for example, in predicting that “airline travel will be just as uncomfortable as it is today .” As we all know, it is WAY MORE uncomfortable. What is the source of such profound insight? Was it a futurist, global consulting group, a recently declassified CIA study, or 1997 translation of Nostradamus? No. Ready? It was Scott Adams, best-selling cartoonist. You should not be surprised as humorists as rule are a very savvy, observant group. It was said of long-time Tonight Show host Johnny Carson that you knew which politicians were in trouble just by listening to his opening monologue. So, when you are seeking help in figuring out long term trends, never prematurely narrow your search – err on the side of broadening it. The Dilbert Future – Thriving on Stupidity in the 21st Century, HarperCollins, New York, 1997, pp. 31, 48, 132, 160, 171, 198, 202, and 221. What headlines in the health insurance industry! It is an industry which has traditionally looked at itself as relatively protected from outsiders. (Remember the concept of “barriers to entry”?) First, Obama Care turned the individual market upside down and may have threatened its very existence. Then, there is massive change is coming or pending due non-insurance firms including CVS, Walmart, JPMorgan Chase, Amazon, Berkshire Hathaway. Question – did the competitive intelligence teams at the major health insurance companies foresee this sea change and warn their management? I do not know for certain, but having spent time there, I am guessing not. Why? I think that the health insurance industry, like too many others, erroneously favors experience in the industry over CI experience/training in its CI providers, both inside and out. And that preference for industry specialist over generalist is widespread. Let me give an example. Some time ago, a head hunter contacted me looking for a candidate to fill a slot in another “health” industry. The client’s detailed specifications required x years of direct CI experience in that industry – only. The client was willing to drop back on time in CI, but not in time in the industry. It was non-negotiable. I told the recruiter that there were not just very few people that met that standard, but in fact there was only one. And that person I knew was soon retiring. I pressed, and soon learned that the headhunter’s client was the very firm where that person worked. I told the recruiter that I knew of many excellent candidates with extensive CI experience, but their industry experience was in related industries. The recruiter replied that the client was adamant. So, the client ultimately found no one, by ignoring more general experience in favor of specialized industry experience. Over time, the CI unit basically dissolved. 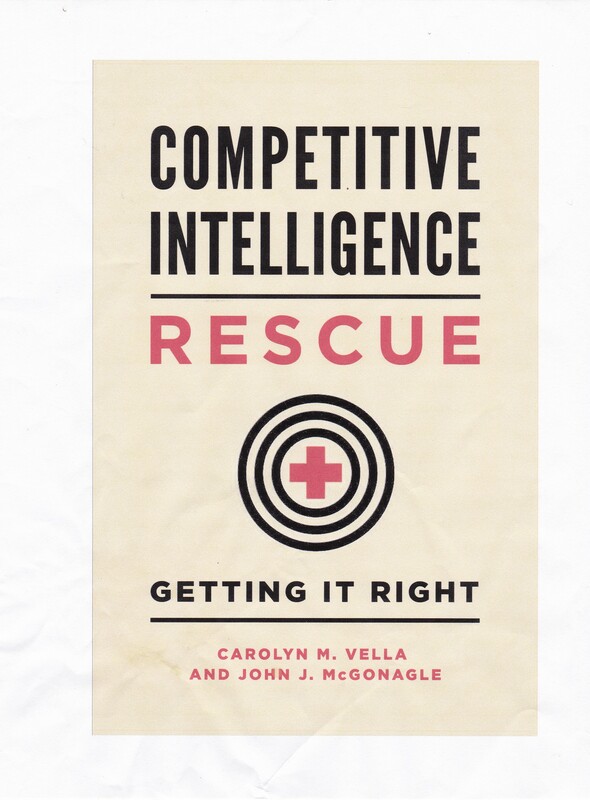 in our new book, Competitive Intelligence Rescue: Getting It Right (Praeger 2017), Carolyn Vella and I relate a case dealing with DIY CI (chapter 8). . Let me give you a couple of my thoughts on DIY CI. My own perception is that the first group is static or growing slowly, the second is stable or slightly declining, and that the third is growing steadily. Compared with 10 or 20 years ago, the existence of DIY CI marks an important evolution, if not revolution, in CI. Those growth trends, if they continue, may fundamentally change the CI “business”. One plus from this is that it shows an increasing use of CI in enterprises, coupled with better access to end-users, particularly since the end-user in DIY CI is the person who generates the CI. It should also mean that the time between a perceiving a need for CI and its creation could fall. Those producing the CI will necessarily have narrower experiences in producing it, since they deal only with one client. That could result in a loss of professional perspective or even the failure to develop it. The use of elicitation interviews will necessarily fall, thus diminishing use of a proven, valuable primary research resource. What does this mean? One consequence could be that CI degenerate into several subspecialties where experience and developments are not easily transferable, such as IT CI, pharma CI, B2C CI, etc. Another consequence could be that CI could morph into a discipline that will not be able to look forward as easily as is it can look back and look at the present. Why? Because data on future actions and intentions lies with people to a significantly greater degree than in published sources. A third could be the separation of early warning processes from everyday CI, in part due to the lack of necessary broad perspectives among internal personnel. Institute regular awareness sessions and focused training both on producing CI and on using it. To avoid inbreeding, vary the sources for that training. That is use insiders, then external resources, and vary the outside providers over time. How do these observations apply to competitive intelligence? They mean that planning of any sort must not end with the plan. Being a part of the process means learning to work with all others similarly situate, even after the plan is done, to take necessary action based on accurate intelligence. You and they must be constantly alert to all of the changes that will impact the plan, or even render it useless. You may be asked to work with strategic planners and provide CI, whatever it is called. Keep in mind that the need for such intelligence never ends at the “completion” of the planning cycle. Whether or not recognized by the planners themselves, CI is even more vital to the entire planning and execution process once the plan is done. Why? Your competitors and the competitive environment will not give you the luxury of staying static or doing what you expected them to do in response to your firm’s actions, just to accommodate your planned efforts. Stay linked to those throughout the process and focus on keeping them updated rather than waiting for the next cycle or even the next updating meeting. Quoted by Dean James Stavridis, Fletcher School of Law and Diplomacy, in “Trump’s national security strategy leaves too much unsaid”, Time, January 22, 2018, p. 45. Isaac Asimov, The Foundation Trilogy, Ballantine Books, 1983, p. 126.